Victor Reinz® engine sealing solutions include cylinder-head cover and oil pan modules. Depending on the application, the system can include the cover, the gasket, or the fasteners. Our engineers work directly with light-vehicle OEMs to develop innovative products using quality materials that meet their specific engine requirements. Utilizing regional research and development centers, we employ expert problem solving to deliver custom sealing solutions. With experience in over 35 applications, we design and manufacture cover modules for gasoline and diesel engines. Our engineers work to address needs such as emissions; weight; noise, vibration, and harshness; durability; and cost. This robust module functions as one precise unit, as we design the sealing system as part of the cover design. To address fuel economy, our designers are constantly seeking new ways to reduce weight under the hood. 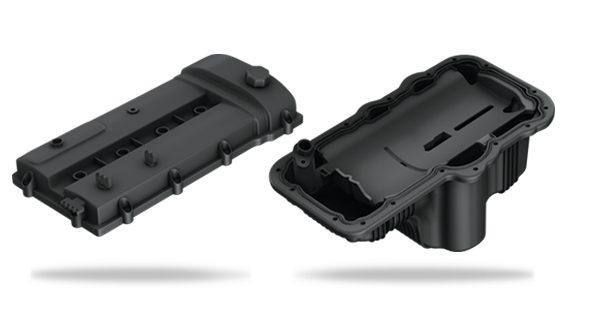 Our advanced thermoplastic oil pan module integrates multiple parts into a single component, offering considerable reductions in weight and cost compared to a traditional stamped pan.